The story of how the life of Tilikum, the SeaWorld orca, came to mean the death of Dawn Brancheau, is complex and takes some telling. So I am glad to say that the uncut version of the story, which was originally published in Outside, is now available in e-book format. This version is based on the original 11,500 word draft I wrote of the story, which chronicles Tilikum’s capture and separation from his family, and the physical and psychological stress he experienced in marine park pools over some 30 years. 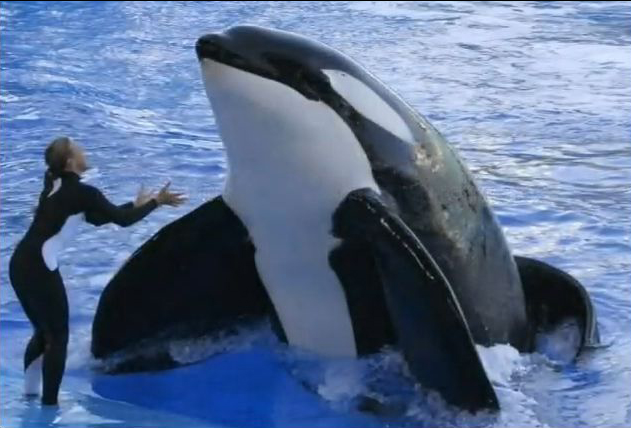 It explores Tilikum’s involvement in two previous deaths. And it details the history of the killer whale industry and the inherent risks of using captive killer whales for human entertainment. The e-book version is available at the iTunes store, for iPad, iPhone, and iPod Touch. And it is available at Amazon, for the Kindle. Here is a photo I was recently sent, which dramatizes the contrast between Brancheau and the killer whale that tragically ended her life. except the picture on the cover of the book isn’t Tilikum? Bought it – now to get my Kindle back from my daughter. Thank you Tim! Thanks, Janice. When I can’t find my Kindle it is always with my daughter, too. I just might break down and get her her own. Bought it. Thanks for researching and writing about the Tillikum story. I’ll review it in my little whale zine for you. Just bought it for my Kindle. Thank you so much Tim for taking part in exposing the truth that Killer Whales should not be held captive for human entertainment! Can’t wait to start reading it this afternoon. I cannot wait to read this Tim! Thank you for exposing the truth about Killer Whales in captivity! Tim, I brought the book and downloaded it onto ibooks (I’m one of the poor souls that as of yet, don’t own a Kindle!). It’s a fantastic read, and I’m halfway through it. I also enjoy your posts and blogs very much indeed. Got the download right away, and once I started I could not finish it to the end. I’ve been following killer whales in captivity for about 20 years. I think you did above and beyond a fantastic job at getting all the nitty gritty details in writing and to understand it from the whales’ perspective. Please keep on this topic and continue writing about what goes on. THANK YOU THANK YOU THANK YOU! Thank you for the work you’ve done. It’s extraordinary and courageous. You and other anti-captivity advocates, scientists, etc have compelled me to spend much of my free time and income on this cause as well. There’s no contrast! Tilikum was taken from his NATURAL environment and was expected to perform like a monkey. Yes, intelligent, yes, loved to please humans and YES, aggravated as hell like a human that he was overworked and under-rewarded that day. It’s not rocket science!